Lets say you want to setup a server using Vagrant and Ansible and you want to put your code onto the server by checking it out from a private repo from some place like BitBucket. Further, you want to make it possible for the server to checkout new updates. Here is one way to do it. First create a RSA keypair. There are lots of examples of how to do it. This is a good one. When you complete this, you will have the keypair on your local machine, which will be useful if you want to check code from the repo. Next, put a copy of your public key (*.pub) on the repo site (e.g. Bitbucket). The repo site will have instructions for how to do this. To provide maximum isolation between customers, I prefer to set each one up on its own VPS. One down-side to this approach is it is a pain to setup a new server. In the past, I used Fabric. But recently I read High Performance Django. In that book, they go out of their way to advise against using Fabric. They like Salt. After a little googling and a few coin tosses, I decided to give Ansible a try. At first the going was a little rough, then I discovered this gem of a repo on Github: ansible-django-stack. It even uses Vagrant, another package I have wanted to try. This repo is insanely helpful. It even comes with a fully functional Django project. This was incredibly helpful for figuring out how to get Pycharm working with the virtual machine created by Vagrant. Just follow the docs in repo and in a few minutes you will have a fully functioning Django site, running the components any serious Django project needs. This will change your life. 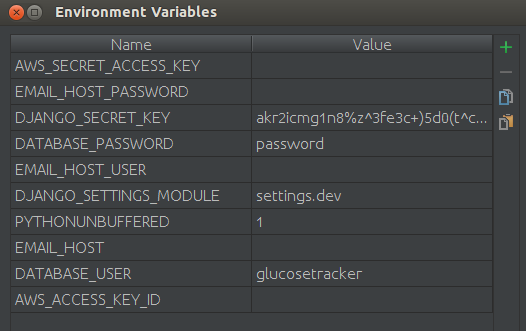 Setup a Droplet using Ubuntu 12.04.5×64 because that is what the Vagrantfile specifies. If you want to setup a different OS, change your Vagrantfile. Make sure to include the comma after the IP address. This tells Ansible to not look for an inventory file and to just run the playbook on that server. That’s it! Go to http://192.168.33.15/ and you will see a fully functioning Django site! One powerful feature of Vagrant is it’s “Synced Folders” function. Actually this is a misnomer. A synced folder is a folder that is accessible on your host machine and the virtual machine. Thus there is no synching involved. They are the same physical location. Now open this repo with PyCharm just like you would with any other project. If you change some of the code and restart the server on the virtual machine, you will see the changes when you reload the page. Yeah But Can I Use the PyCharm Debugger? The best feature of PyCharm is the debugger. But will it work with Vagrant? Of course it will. Those folks at Jet Brains have got you covered. PyCharm (v4) fully supports Vagrant and can run the python interpreter on the virtual machine. To get started, just go to settings>tools>vagrant and do what comes naturally. Then go to Tools on the menu bar and select vagrant up. And ta da! 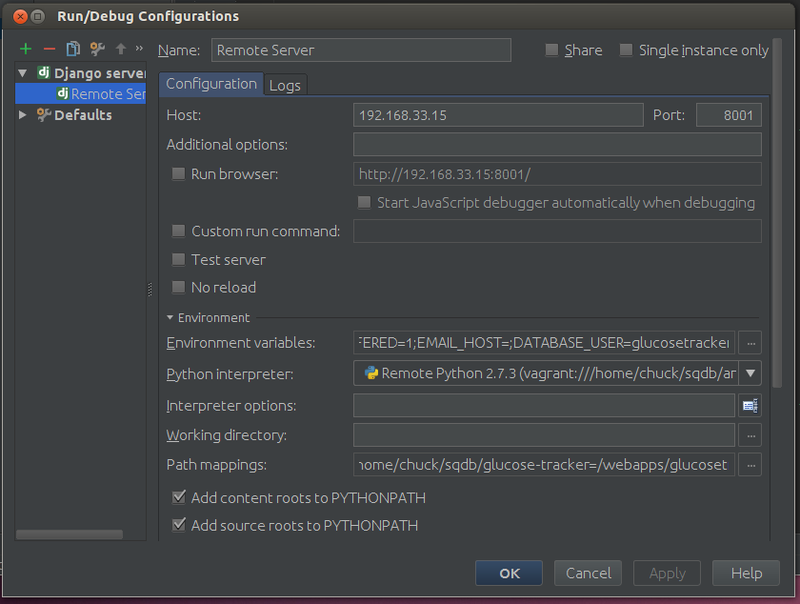 You can now run the project in PyCharm complete with debugging. Now you can add the power of Ansible and Vagrant without sacrificing any of the power of PyCharm! ***Warning: I took these notes as I tried to create a droplet using Ansible. I did not get it to work. So if all you want is the answer, this is not the place to be. I have been using AWS free tier for a while. Based on lots of googling and the kindness of other bloggers, I eventually got a fabric script that sets up and manages my sites on AWS. Getting that fabric script working was a real challenge because the AWS API is a moving target and the docs are lacking. I just found out my free period on AWS is about to end. While I think AWS is probably a pretty good way to go if you have a lot of traffic and VC’s paying your bills, many of my sites are very low volume (50 users, less than one page view per second). Thus AWS is expensive over-kill. As I have been googling various subjects, I noticed that lots of answers are on Digital Ocean. So I started looking into Digital Ocean as an alternative to AWS. Everything seemed great, so I signed up and started playing around. I should also mention that several months ago, I read “High Performance Django“. In that book, they have a special, highlighted warning to not use fabric for deployment. Silly me. Just because fabric works well and is easy to understand is no reason to use it. After more googling, I decided to try Ansible. My first impression is that if you stick to the well beaten path on Digital Ocean, things work pretty good. I did their one click installer for Django and had a site running in less than a minute. If you are a noob to Django and deployment, this is the way to go. But I wanted more control of my stack and there seems to be lots of Ansible examples for creating a Django stack on DO. Down the rabbit hole I went. Turns out DO and Ansible are moving targets with lacking documentation. AWS all over again. I posted it to Stackoverflow. No answer in over 48 hours. I am not complaining. In fact I am grateful for the free help I have gotten in the past. However, in contrast, the last Django question I asked was answered in 10 minutes. I suspect this question is obscure enough that I will never get an answer. dopy.manager.DoError: You specified invalid ssh key ids for Droplet creation. Which is the error message the Digital Ocean API sends back. Here is a solution to a similar problem. They are using the python Requests module. dopy uses Requests. The difference between that solution and dopy is dopy does not explicitly JSON encode the parameters. I think Requests does that for you if you give it a dict. Therefore, in theory, there is no difference between the two. Also, I was able to create a new droplet, with an SSH key using python-digitalocean v1.1. Use the DO web interface to create a new droplet. In the Add SSH Key section, make sure to highlight the SSH key you just made. In the “getting started” section of Ansible, it shows you how to use Ansible to ping a server. Lets do that. create an inventory file. I called mine test_inventory. It’s contents was just the IP address of my droplet. If you run it again with the -vvvv option, you get an very confusing and long set of debug messages. This is the problem with Ansible. Simple mistakes that noobs are likely to make, lead to confusing error messages. I am sure the “Access Denied” error above is a similar noob mistake.